In the interwar period, France and Germany worked towards an integrated Europe. The First World War saw the dynastic empires of Central and Eastern Europe crumble, as subject peoples exploited the chaos of military defeat to grasp their national independence. The US President, Woodrow Wilson, was a staunch advocate of national self-determination and saw the Allies embed this principle, sometimes retrospectively, within the Paris Peace Settlement of 1919-20. In his article for History Today in July 1999, ‘Two Cheers for Versailles’, Mark Mazower reminded readers that, for all its shortcomings, there was ‘no palatable alternative to the nation-state then, or since’ and concluded that the Paris Peace Settlement continues to offer lessons for today’s statesmen and stateswomen. Mazower has written extensively on the darker, often racialist dimensions of nationalism, which makes his qualified advocacy of democratic nationhood all the more striking. However, his 1999 article passed over an important element of 20th-century Europe’s story: that of European unification. The French and German Foreign Office archives record a sustained, mutual effort to defuse their tense interwar relationship by way of European integration. Economic synergies and the evocation of a common, Christian, pan-European moral and cultural heritage saw France and Germany agree, in September 1931, to establish a bilateral customs and economic union as the first step towards a wider European union. and even misunderstood, not least in the English-language literature. Looking back a decade or more, the pre-First World War French prime minister, Joseph Caillaux, shared his contemporaries’ fears of German militarism but, rather than confront Germany, he sought to improve relations through mutually beneficial economic collaboration. Klaus Wilsberg has demonstrated that far-reaching commercial links between the French and German business sectors offered Caillaux the means to achieve his objectives. Unfortunately for the cause of peace, his ministry fell in January 1912 and his successor, Raymond Poincaré, looked to France’s military alliances to guarantee national security. French diplomacy revisited Caillaux’s strategy immediately after the Great War. A secret delegation sounded out Berlin in January 1919 about plans for a Franco-German partnership to reorganise the European economy and, although this initiative failed, two further approaches followed in 1921 and 1922. The 1921 Wiesbaden Agreement envisaged German reparations payments to France being replaced by massive German direct investment in the devastated war zones of northern France, but British obstruction effectively derailed this initiative. 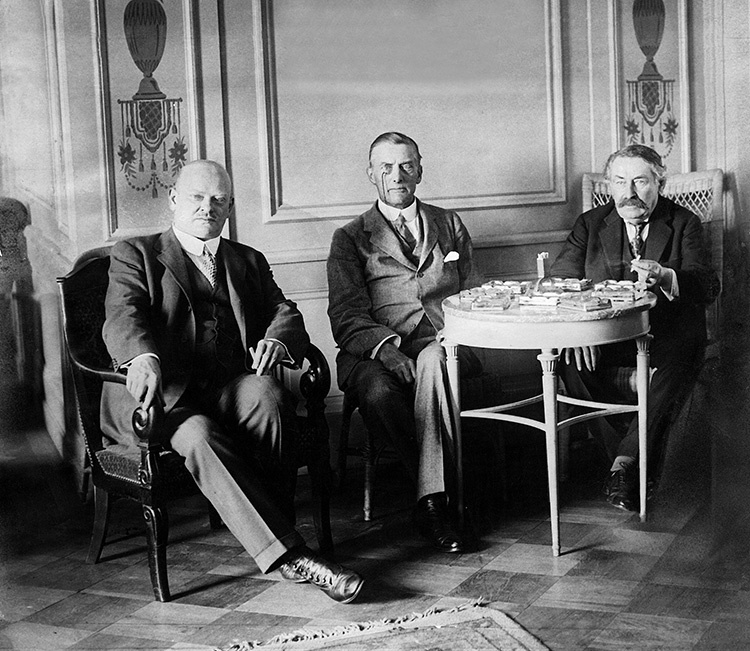 The 1922 Stinnes- Lubersac Agreement, concluded between the German and French business magnates and parliamentarians, sought to revive the Wiesbaden Agreement, but failed to win over Poincaré, who had returned to office in January. By this time, Germany had suspended the payment of reparations in cash as its domestic finances imploded, bringing Poincaré to favour coercion over consensus. In January 1923 a French-led expeditionary force invaded the Ruhr, Germany’s industrial heartland, ostensibly to collect unpaid reparations, but in fact, as recent research reveals, to precipitate the territorial fragmentation of the Reich. The ensuing standoff bankrupted Germany, but left France almost empty handed and saw Poincaré voted out of office. Britain and the United States brokered a mediated settlement of the immediate reparations crisis, while thoughts in both Paris and Berlin turned once again to reconciliation. Both countries recognised that attempts to gain advantage over the other invariably proved self-defeating. They accepted that deep-seated Franco-German disputes, for example over disarmament, could not be easily or quickly resolved, but there were also areas where agreement was conceivable. The economy remained a promising arena for collaboration and a series of Franco-German private business cartels had already re-formed or been agreed from scratch since the war. French leaders had also begun to question whether individual European states could sustain their empires in the longer term and whether they were a match for the emerging continental superpowers, such as the United States and (potentially) the Soviet Union. Such ideas informed Briand’s thinking when, in 1929-30, he proposed creating a European Union, while Stresemann entertained comparable thoughts up to his death in October 1929. It followed that France and Germany would pursue rapprochement through the medium of European integration as national governments pooled aspects of sovereignty. French and German officials understood that even economic integration would entail a wider range of common policies and both countries also evoked common values, democratic and Christian, further to legitimise European integration and to counter the growing challenges of Bolshevism and Fascism. The archives reveal that, contrary to received wisdom, Stresemann’s successors remained dedicated to Franco-German rapprochement and European integration, before a complex succession of forces and events derailed the project during 1932. 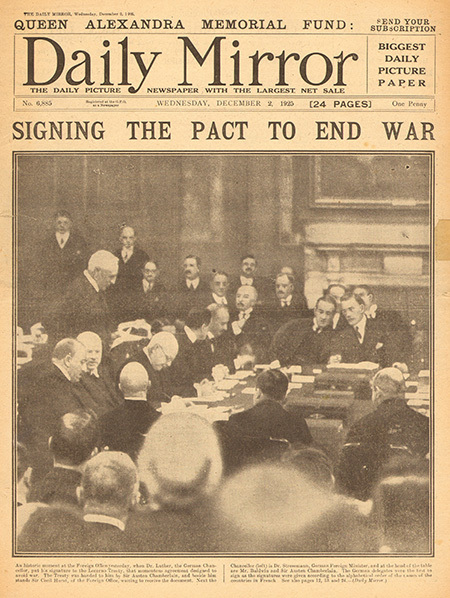 However, the template for today’s European Union had been laid down and if contemporary Europe does, as Mazower argued, owe much to the Paris Peace Settlement, it also owes a major debt to the interwar partisans of a common European home. Britain proved a sceptical onlooker during the interwar period and, to this day, has struggled to come to terms with the Franco-German vision of a shared European identity, which claims to complement older notions of historical nationhood. Conan Fischer is the author of A Vision of Europe: Franco-German Relations during the Great Depression, 1929-1932 (OUP, 2017).